An Accountable Care Organization (ACO) is a group of doctors, hospitals, and other health care providers, who voluntarily come together to give coordinated high quality care for a defined population of patients. The goal of coordinated care is to ensure that patients get better care, while lowering costs by avoiding unnecessary duplication of services and preventing medical errors. The ACO model differs greatly from traditional fee-for-service, which pays providers for each type of service rendered. The ACO model not only ties payment directly to patient outcomes but to how quickly and efficiently the care is delivered to the patient. When an ACO succeeds by meeting all the quality and efficiency benchmarks, the group can share in all or part of the savings. Transitioning from a traditional fee-for-service model to an ACO reimbursement model can be a risky undertaking for most organizations. 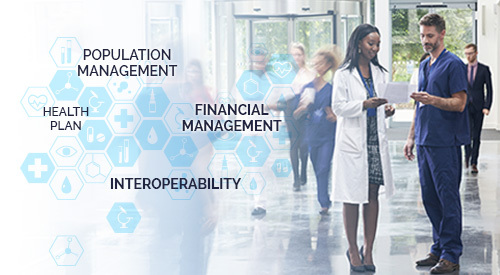 The WRS Health IT Platform provides you with a full suite of services from electronic health records and revenue cycle management to health information exchange connections, all designed to ensure an easy transition while capturing all the key data points you need to track and report on your benchmark goals. Interoperability between EHR platforms, health information exchanges, and other external data sources are a major consideration for an organization looking to become or join an ACO. The WRS Health IT Platform provides industry-leading connectivity. We pride ourselves on being able to reliably transfer data within and across organizations as well as externally. Users only need to login and start using the platform to be instantly connected to labs, pharmacies, hospitals and health information exchanges (HIE). The WRS Health integrated cloud-based suite of services comes equipped with automatic practice and patients communications. The ‘Automated Health Maintenance’ function features alerts for: labs, tests, follow up visits based on condition, medication, as well as additional alerts and messages that can be customized to the practice. Fully integrated Patient Portals allows patients to access their health records, correspond with the practice and receive lab results. For an ACO or a participating organization, communication and coordination of care is of the upmost importance. With WRS Health, everything is integrated into the patient’s EMR, enabling a seamless data flow, coordination among providers, locations and reporting. Ensuring patients get the right care at the right time. WRS Health electronic health records come pre-populated with customizable specialty-specific content that reduces charting time and eliminates duplicate entries. Our seamless workflow delivers a cohesive, end-to-end solution that is centrally delivered, maintained and secured designed to avoid duplication of services (decrease in total cost of care) and medical errors. WRS has an order tracking system (OTS) to make it easy for practices to monitor the status of labs or procedures ordered as well as to review the results and forward to the patients via several different mechanisms. All actions flow from your order including receipt of results, patient messages and notifications, billing and charting. OTS also follows up on non-compliant patients sending reminders when orders are not completed by a specified date. All actions are automatically documented in the system allowing for easy outcomes documentation and reporting. WRS also provides system-integrated connectivity to health information exchanges. Health Maintenance Rules Engine for identification and communication for defined population based on variables such as clinical conditions, demographics, diagnosis procedures, prescriptions, etc. Meaningful use is expanding to include patient satisfaction, financial and operational measures. WRS integrates all of these features in one platform. WRS Health’s integrated portals not only give patients access to their health information, but also provide patients with education tools and secure provider communications. Additionally, WRS Health integrated patient portals also support the proactive patient engagement requirements of accountable care organizations. WRS Health provides real time claim scrubbing, electronic remittance and payment posting. WRS has integrated charge capture – when clinician charts a procedure the charge flows directly into the claim automatically. Additionally, The WRS Health IT Platform has the capability to access and share both clinical and financial data outside of your organization. Custom reports based on specific needs such as location, demographics, procedures, providers, etc.